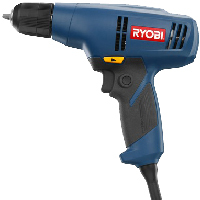 The Ryobi 3/8 in. corded Drill/Driver features a 4.5 Amp motor that offers up to 1,500 RPM for powerful drilling and driving in a variety of materials. The variable-speed trigger helps you match the speed to the application, while the lock-on feature enables continuous drilling and helps to reduce operator fatigue during long drilling times. The ergonomic handle includes a GripZone for comfort during use. Powerful 4.5 Amp motor for various applications. Keyless 3/8″ chuck for quick bit changes. Ergonomic design for comfort and balance and built-in level to improve drilling and driving accuracy. Variable-speedreversing trigger for drilling and driving requirements.